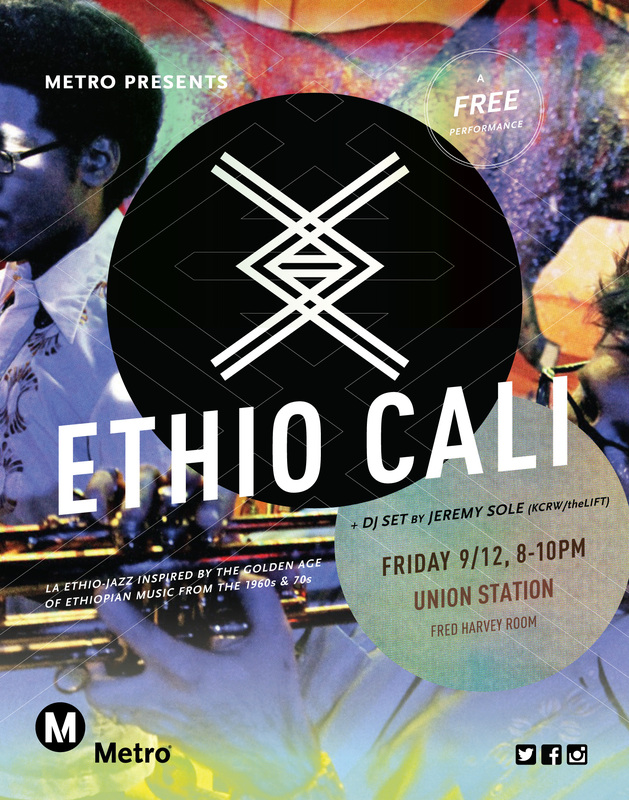 Metro Presents showcases an exciting array of free arts and cultural programs at historic Union Station…. In celebration of Ethiopian New Year, we’re excited to present Ethio Cali, a Los Angeles based Ethio-Jazz ensemble, led by trumpeter, arranger, and composer Todd Simon. The ensemble’s sublime sound is inspired by the golden age of Ethiopian music of the 1960s and 70s, filtered through a lens that is uniquely Los Angeles. Acknowledging the diverse musical foundations of Ethio-Jazz, the ensemble also draws inspiration from the rhythmic and melodic textures of Sudan, Somalia, Ghana, and Colombia. DJ Jeremy Sole (KCRW / theLIFT) spinning before & in between sets. While admission is free, space is limited and attendees will be admitted on a first-come, first-served basis. Come early and hear DJ Jeremy Sole of KCRW / theLIFT spin some tunes! Doors open 7:45.